CALGARY, AB – Tool Shed Brewing has announced the upcoming release of a new beer made with 100% Alberta-grown ingredients. This feat of Alberta beer-engineering and all around provincial masterpiece showcases all local ingredients. With hops from Northern Girls Hopyard, 2 row malt from Antler Valley Farm via Red Shed Malting, wheat from Rahr Malting, and wild yeast from Scott Keller Farms, it is a veritable Albertan flavour explosion. 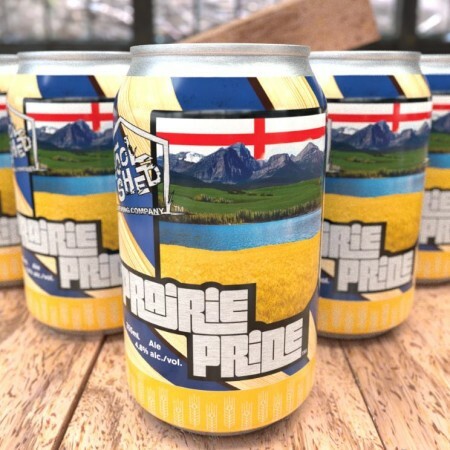 Tool Shed Prairie Pride will be available soon in 355 ml cans throughout Alberta. For more details, see the preview profile of the beer at On Beer.